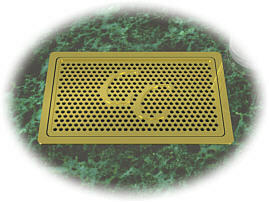 Custom Cupholders offers elegant custom drip trays for galleys, bars and other beverage areas. Each unit is precisely machined from 6061-T6 aluminum to individual requirements and specifications. Included is a sturdy, nippled drain bib and an easily removable top screen that snaps into place. Because of our manufacturing method, unique sizes and accent touches are much more easily incorporated than would be possible with a brazed or stamped piece. And lead times and costs are much more reasonable than you might expect. 14.5"L x 4.5"W x 0.6"D unit with optional finish shown. 7.6"L x 4.6"W x 0.6"D unit with optional finish shown.